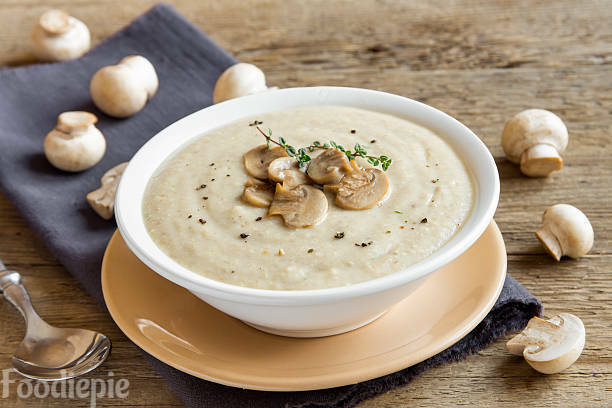 Mushroom Soup Recipe - This quick and easy mushroom soup recipe is a great source of nutrients. This American recipe, prepared with mushrooms fresh cream and spices this an easy vegan Mushroom Soup that serves as a perfect for occasions during the winter. Serve Mushroom Soup this lip-smacking and delicious soup with your toasted garlic bread. It's rich and creamy and looks attractive! There are several ways to decorate this magnificent soup. Use lemon grass leaves, basil leaves, black pepper powder or even baby tomatoes, all you have to do is find out your culinary skills and want to hunger and invite your table.Now let's checkout recipe first. Step 1 : Wash all the mushroom well.Dry them with kitchen towel and cut them.If mushrooms are too dirty from outer then wash and peel them gently otherwise no need to do this.Remove stems,slice cleaned mushrooms. Step 2 : Add 1 or 2 table spoon butter in the pan and heat until it is melted. Put ginger,chopped white onion, chopped garlic cloves,ginger paste in butter and fry lightly. Step 3 : Now add chopped mushrooms, salt, black pepper, mix all ingredients well, and cover them with lid, let them cook for 3-4 minutes on low flame.Uncover the lid and check they will shrink in size and release water,Cook for 2/3 minutes again without lid so that mushrooms become soft. Step 4 : When water is almost absorbed then remove approx 3 tablespoon mushrooms in plate and keep aside and put remaining mushroom in grinder jar with some water and grind them make a thin paste. Step 5 : Now add cooked mushrooms which we leave in plate and grind ed mushrooms paste in pan.Add 2 cups of water,allow them to one boil after 2-3 minutes of boiling water,add corn starch stiring continuously to dissolve the lumps in the soup, boil the soup for 2-3 minutes, add 1 table spoon cream, turn off the flame. Step 6 : Mix 2 teaspoons of lemon juice and mix it. Finally : Best of cream Mushroom Soup is ready garnish with coriander leaves and serve hot soup.